Very friendly and helpful staff. Very comfortable bed. Excellent breakfast. Close to old town bars and restaurants. My wife and I arrived at the hotel 5.30 pm Dec.16th I waited at reception for approx 30 minutes. It was unattended. I banged the desk, I sounded the alarm,I walked upstairs calling for attention, I waited and waited, no response. I gave up and checked into another hotel in Angouleme. I have stayed at Accor hotels many times, never have I experienced anything like this anywhere! Clean hotel. Comfortable twin room Towels very small for taking a shower Had to ask for more. For a budget hotel, quite satisfactory. Easy. Well looked after by the good staff there. Good value. Clean and tidy. Very friendly helpful staff. Bonjour Mme v., Nous vous remercions d’avoir choisi récemment Ibis Budget Angoulême Centre. Merci infiniment d’avoir pris le temps de commenter votre séjour. Parce que votre satisfaction est notre priorité, vos appréciations et commentaires nous sont extrêmement précieux afin d’améliorer sans cesse la qualité de nos prestations. Nous sommes ravis de constater que votre séjour parmi nous se soit dans l'ensemble bien déroulé. Votre satisfaction est la plus belle récompense pour notre personnel qui travaille jour après jour pour vous offrir un service irréprochable. Nous espérons avoir le plaisir de vous accueillir lors d'un prochain séjour à Angoulême et dans cette attente, nous vous prions de recevoir nos salutations les meilleures. 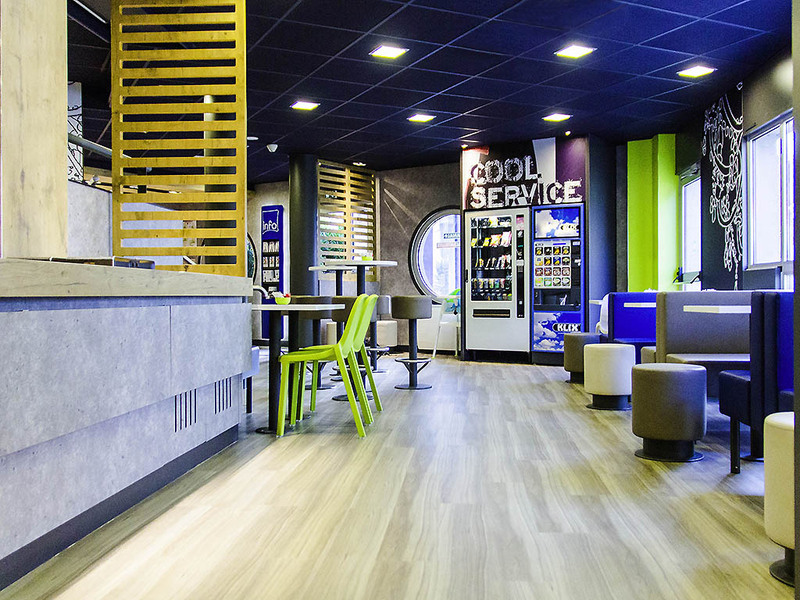 Bien cordialement, Sonia Mesnadi et toute l'équipe de l'hôtel Ibis Budget Angoulême Centre. Comfy beds, cleans sheets and towels, good shower, effective air conditioning., cheap, just what we needed. a bed to sleep in. The welcome was good. The hotel was clean. The room had the bare minimum. That sums it up.....a bed to sleep in. The hotel is small and rather dingy. Receptionist was helpful with checking in; Limited parking - public parking nearby. The room was small & not very clean - there were cigarette burn marks on the floor. It had been a hot day and the room was hot. Air con didn't work. Noisy street outside so leaving window open was not conducive to sleep. The bathroom was tiny - hardly enough room to move around. I realise this is an Ibis Budget hotel, but the standard was disappointing. The hotel provided everything required. It was easy to find, very close to the centre of both the older and newer parts of town, had a friendly staff, had parking for my car and the room was comfortable, clean and quiet. Efficient and polite staff. Clean room. Room a little careworn especially where cases may have bashed the walls, otherwise fine and we will come again. Very convemient for walking to the town centre, walking distance from the railway station and close to a covered car park. The hotel is correct, clean, low on on price, the service is ok, and breakfast enough, but the room are very small.... we'll nothing very special. The staff were welcoming and very helpful. The continental Breakfast was wonderful and was restocked very quickly. There were a few issues that you need to address and that is size of Towels which were too small especially for my friend who is larger than I . Need to have at least 2 pillows per person and the Mattress was very hard and uncomfortable. really suffered with my back and neck because of it. Conveniently located between the station and the historic centre in a grey modern building (it really does look like a budget hotel!. Rooms are modern and minimalist, but quite comfortable. Breakfast available at additional charge. Found reception friendly and helpful. Clean, but walls could do with a repaint. The room is quiet, clean and has the basic things that you need to stay a short period. The bathroom needs to has a floor cloth like in other ibis budget. The hotel is in a good location near to the stores and good restaurants. Budget hotel, and it is. That said the staff were 1st class, incredibly responsive and helpful always with a smile.The shower brilliant. Location was pretty much perfect and breakfast was more than acceptable. I guess the reservation was that it would have been nice to have a few shelves or wardrobe rather than live out of a case but if you were staying overnight, its perfect . I would use it again for sure.